Hello December! Hello Christmas lunches! After Halloween, I think Christmas lunches are my favorite themed lunches to make. I’ve loved dipping into my Christmas supplies this week, as well as playing with a few new toys. 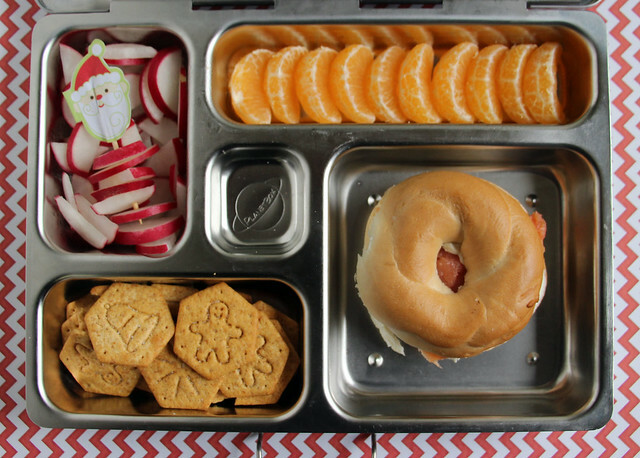 I have to go light on the Christmas stuff with Wyatt since he’s a sophisticated 4th grader now, but he didn’t mind me adding a few touches to this PlanetBox lunch: radish slices with a Santa pick, clementine slices, a mini bagel with lox and cream cheese and holiday Wheat Thins. 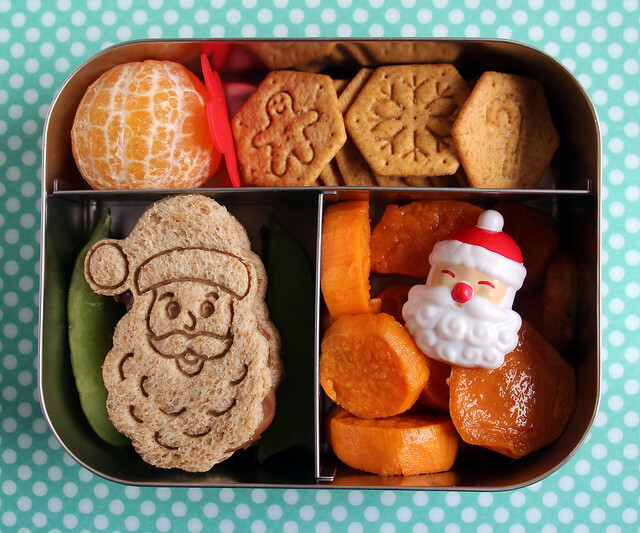 I packed a Augie this Santa-riffic lunch in our LunchBots Trio: a clementine (they’re like candy, right now! ), holiday Wheat Thins, leftover roasted sweet potatoes with a Santa ring for decoration, and a stamped Santa peanut butter sandwich on a bed of sugar snap peas. 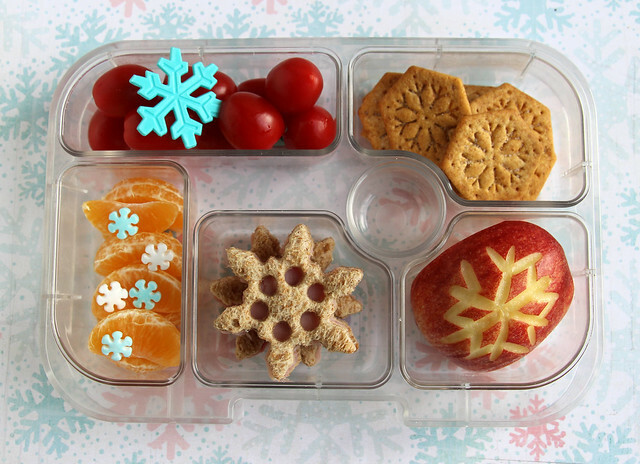 Tuesday Augie had this snowflake lunch in our Yumbox : tomatoes with a snowflake pick, Holiday Wheat Thins, a couple chunks of apple with a snowflake carved in them, two tiny snowflake ham sandwiches and clementine wedges with snowflake sprinkles . 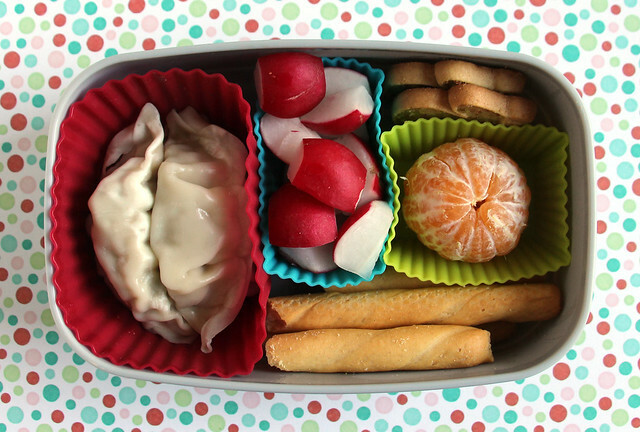 On Wednesday, I defrosted a few chicken dumplings and put them in Wyatt’s lunch box, along with radish chunks, a couple sugar cookies, a Cutie and some breadsticks. This lunch was packed in a single layer of our Bentgo and I divided it up with my new rectangular silicone cups . 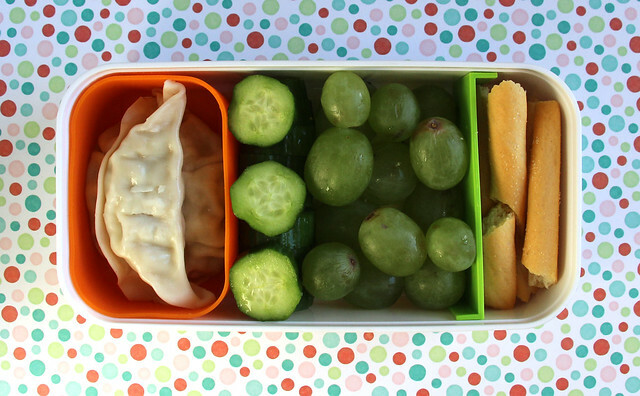 Augie also had dumplings, along with Persian cucumber slices, green grapes and breadsticks. I packed his lunch in a single layer of our monbento and I used one of my new silicone cups that’s specifically made to fit in this box. Thursday, both boys took leftover pasta to school in their lunches. 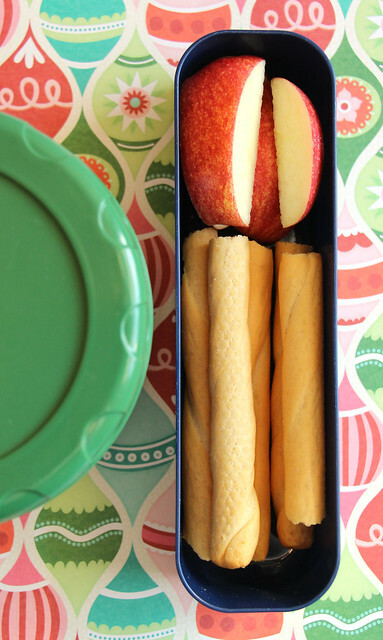 Wyatt’s was packed in our LunchBots Thermal jar, along with a side car of apples and breadsticks. 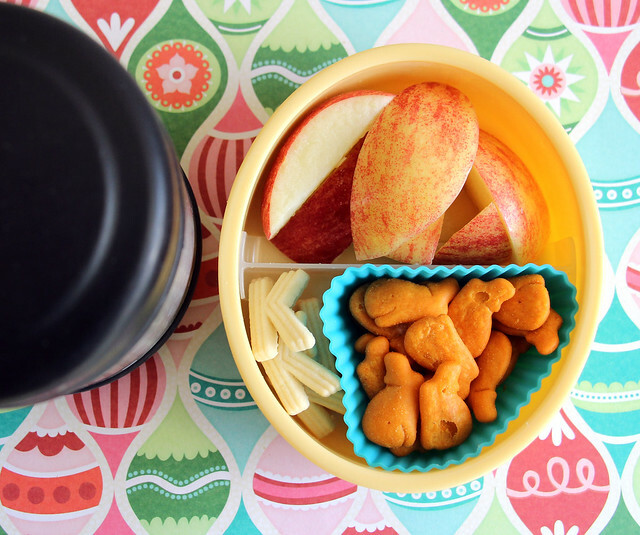 Augie’s pasta was packed into our Thermos food jar with a smaller box holding apple chunks, K cookies and whale crackers on the side. Today, I pulled out Wyatt’s favorite Laptop Lunches box for his lunch. 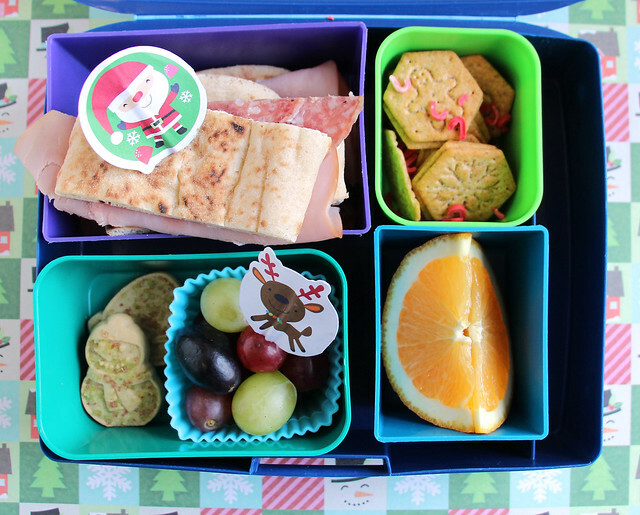 He had a ham and salami sandwich on garlic naan, holiday Wheat Thins with candy cane sprinkles for color, orange slices, grapes and sugar cookies. Augie had orange slices, Persian cucumbers with a little penguin pick, a snowflake peanut butter sandwich, and some grapes (under the sandwich). 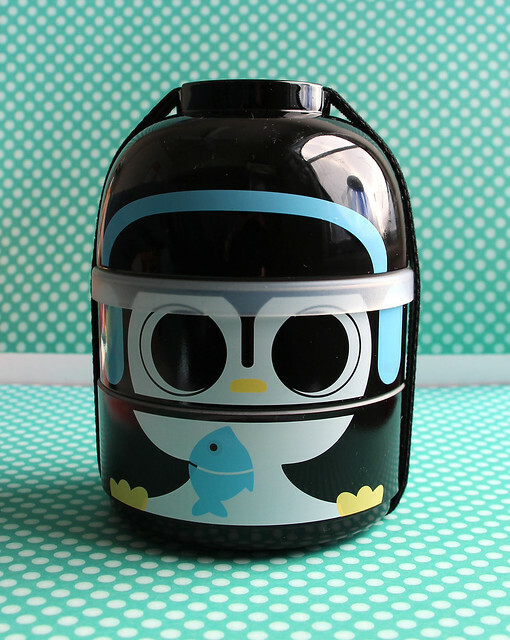 This lunch was packed in our new CuteZcute Baby Bento Buddies penguin lunch box. My friend designed this set and she sent me a sample to try out. 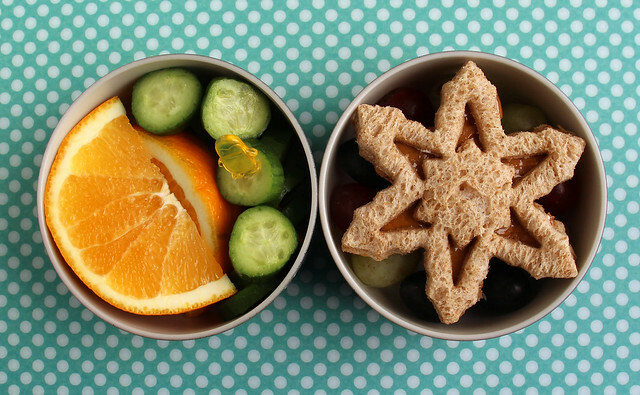 It’s fairly small and it’s actually designed to hold snacks — not a full-sized lunch — but was dying to take it to school so I decided to give it a try for lunch duty. I found that when I packed it tightly I could get enough food into it. The food goes into the bottom two compartments and when you remove the lid, it can be used for a bowl. I liked the penguin design best, but it also comes in cute owl and panda designs.